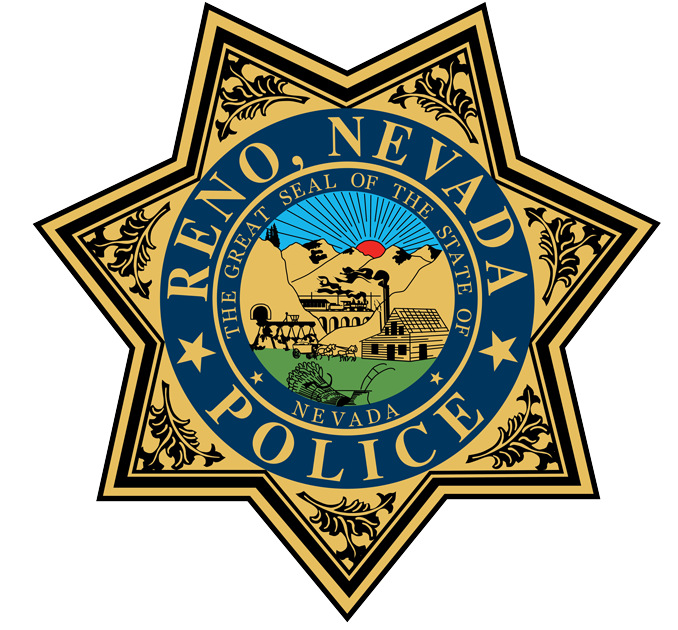 Did the incident you are reporting occur within Reno city limits? Are any of these situations involved in your report? Select the report type you wish to file. Entering a building or structure unlawfully with intent to steal property. Example: Property removed from a locked or unlocked home or business. Used for documentation purposes only, such as violations of Court orders, contractual disputes, etc. The intentional damaging of private or public property. CALL 334-2121 IF THIS IS CURRENTLY HAPPENING. Example: Breaking of a window; damage to a mailbox; vehicle tires punctured, etc. Any person who makes annoying or malicious noise to disturb the peace of another. CALL 334-2121 IF THIS IS CURRENTLY HAPPENING. Example: Person making obscene or improper statements to others, neighbors constantly pounding on the ceiling or walls, loud music, etc. Example: Spray-painting drawings on a door or wall, defacing signs, drawing gang initials on a vehicle, etc. Obtaining someone else's personal identifying information and using it to obtain credit, goods or services. Someone obtains a credit card using your S.S.N. or obtains phone service using your personal information. When property is lost or misplaced. Example: Property that is missing, property left somewhere as in a restaurant, or property missing from home. Example: Report unknown, unauthorized, or suspicious persons and/or vehicles observed in the vicinity. Your property is taken without your permission. Please note: Stolen Vehicles or license plates may not be reported online. Example: Your lawn mower is stolen out of your yard, your bicycle is stolen from a rack, etc. Traffic Accident occurred on private property or city street. For accidents occurring on the freeway, or freeway on-ramps/off-ramps, please contact the Nevada Highway Patrol. Example: Someone backed out of a parking space in the parking lot and hit my car. Be sure to use direction of travel, North, South, East or West. Include the street names or physical address of parking lot. Entering another's property without permission. Example: Entering the backyard of a home without permission; returning to a home or business after one has been warned not to be there. Property is stolen from a motor vehicle. Example: Stolen equipment or belongings from a vehicle. Any person that removes or tampers with any part of a vehicle to make it unsafe to drive, or prevent it from operating. Example: Cutting a vehicle's brake lines, loosening the lug nuts, pouring sugar into the gas tank, etc. You must file your police report with the appropriate jurisdiction. Due to the nature of the crime you are reporting, you cannot file an online report. Report in person: Go to either of our two police stations, during hours of operation, and report the incident in person. Open: Mon-Fri. 8 a.m. to 5 p.m.
Open: Thursday 8 a.m. to 4 p.m.
Report over phone: Call the Reno Police Department's non-emergency dispatch number at 775-334-2121. Dispatchers will assess your situation and provide you with the most appropriate options for filing this report. If you require further assistance, please call the Reno Police Department Front Desk at 775-334-2175. El incidente que esta reportando paso en los limites de la ciudad de Reno? Alguna de estas situaciones estan envueltas en su reporte? Ejemplo: Quitar propiedad de un hogar o negocio cerrado con o sin llave. Usado solo para documentacion, como violaciones de ordenes de la corte, disputos contractuales, etc. Ejemplo: Contratos no honrados, visitaciones con ninos no hechos segun la orden de la corte. Destruccion intencional de propiedad privada o publica. Llame a 331-2121 si esto esta pasando ahorita. Ejemplo: Quebrar una ventana, danar una caja de correo, llantas de vehiculos ponchadas. Qualqier person hacienda ruidos molestosos o maliciosos al molestar la paz de una persona. Llame a 331-2121 si esto esta pasando ahorita. Ejemplo: Person making obscene or improper statements to others, neighbors constantly pounding on the ceiling or walls, loud music, etc. Ejemplo: Dibujos en pinturas de espray en una puerta o pared, iniciales de pandilla en un vehiculo, etc. Ejemplo: Propiedad que es perdida, propiedad que se olvido en algun lugar como un restaurante o propiedad perdida en casa. Ejemplo: Reporte desconosidos, no autorizadas, o personal sospechosas y/o vehiculos observados en la vecindad. Su propiedad llevada sin su permiso. Por favor note: Vehiculos o placas robadas no se pueden reportar en linia. Ejemplo: Su maquina de cortar zacate es robada de la yarda, se roban su bicicleta, etc. Accidente de trafico que occurio en propiedad privada o calle de la ciudad. Para accidente que occurio en el freeway o entrada/salida de freeway por favor conctacte a Nevada Highway Patrol. Ejemplo: Alguien que iba en reversa en un estacionamento le pego a mi carro. Asegure usar la direction que iba, Norte, Sur, Sureste, incluya el nombre de la calle or direction fisica. Entrar la propiedad de otra persona sin permiso. Ejemplo: Entrar la yarda de un hogar sin permiso, regresar al hogar o negocio despues de haber sido advertido de no estar alli. Propiedad robada de un vehiculo. Ejemplo: Equipo robado o cosas robadas de un vehiculo. Persona que quita o altera qualquier parte de un vehicle para hacerlo inseguro para manejar o prevenir la operacion. Ejemplo: Cortar las linias de frenos del vehiculo, soltando las llantas, poner asucar en el tanque de gas..
Aunque no pueda hacer un reporte de policia en linia basada en su respuesta, usted tiene dos opciones para archivar este reporte. Por favor vea las sigientes opciones. Debido a la naturaleza del delito que está denunciando, no puede presentar un informe en línea. Para reportar por telefono: Llame al Departamento de Policia de Reno al numero de no emergencia 334-2550. Para reportar en persona: Vaya a cualquiera de nuestras dos estaciones de policía, durante el horario de atención, e informe el incidente en persona. Abierto: Mon-Thur 8 a.m. to 5 p.m.
Abierto: Mon and Wed 8 a.m. to 12 p.m.
Los despachadores evaluarán su situación y le proporcionarán las opciones más adecuadas para presentar este informe. Si necesita más ayuda, llame a la recepción del Departamento de Policía de Reno al 775-334-2175. Anonymously report info regarding any crime. Call 775-322-4900 or visit this Secret Witness link . Report info regarding person(s) using, selling or distributing drugs using this Drug Link at Cop Logic..
At Cop Logic report, info regarding person(s) involved in threating activities that may concern Homeland Security. Drivers who are involved in a traffic collision reported in the City of Reno will be able to obtain crash report information by calling 775-334-2155 extension 0. In Reno, anyone may park on any public street, regardless of who owns the home where the vehicle is parked. However, vehicles on a public street for 48 hours or more without moving are considered abandoned (even if the vehicle belongs to the home it’s parked in front of). Anything that stands out aesthetically, such as damage, flat tires, stickers, etc. How long it has been since it last moved from its current position. Reno Police Department representative will then be dispatched to tag the vehicle with a 48-hour warning notice. Parking Enforcement will verify if the vehicle has moved and may cite the vehicle and submit it for towing. These are usually neighborhood nuisance situations. You will not receive a permanent case number. You may wish to call Washoe Animal Control number 775-322-3647. If you see graffiti on a building, wall, fence, etc., call Reno Direct at 775-334-4636 (INFO) and tell them the location of the graffiti or submit an online service request. We can begin the process to have it removed. If graffiti has occurred on property owned by you, please "Start New Police Report" above to file a police report.